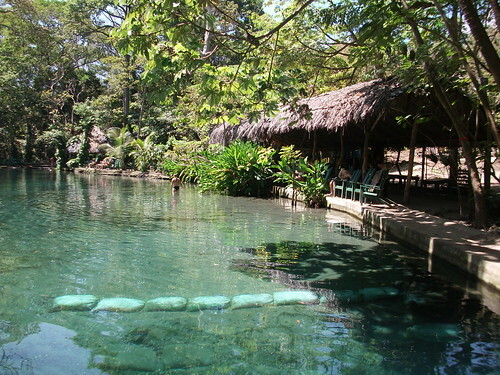 Planning a trip to Isla de Ometepe in Nicaragua? La Presa Ojo de Agua is beautiful little swimming hole near Santa Domingo. It’s made up of several underground springs that glisten and bubble in the sun. Entrance costs $2 and you can stay as long as you like. Chill out on the sun-loungers around the pool or hike through the tropical forest. There’s even a restaurant nearby serving tacos and cold drinks. La Presa Ojo de Agua is located on the narrow stretch of land connecting the two volcanoes (see map below). If you plan on hiring a quad or motorbike, it takes just 10 minutes from Santa Domingo and makes a nice stopping off point on your way to other sites. Looking for somewhere to stay? 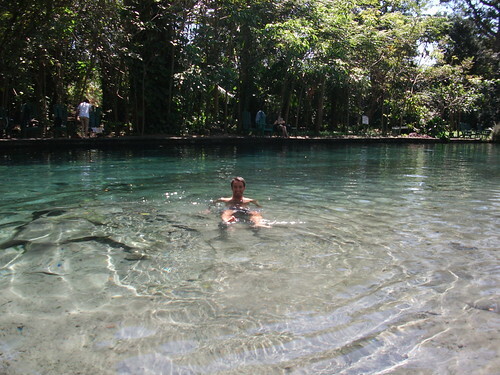 Check out nearby hostels and see more pictures of Isla de Ometepe, Nicaragua. And don’t forget to follow me on Twitter for more travelling updates!